I must admit that I had a bit of a struggle at the start (that’s the reason why this book is rated with 4/5 instead of 5/5 like Everneath). Nikki was a bit too whiny for my taste, but that changed quickly after her decision to save Jack. She is willing to do everything, so instead of complaining, she acts. I admire her for her strength and how she stood up against Cole. It’s always a relief when the MC doesn’t need anyone to save her. Nikki is quite capable of doing things on her own and she is intelligent enough to make clever choices. And when she does make a mistake (because she’s not perfect at all) they are understandable. And Cole.. I do like him, but damn, he manages to give me mood swings. When I finally start to think he is good, he pulls another trick. The complexity and unpredictability of his character are great and he completes the story. Jack is just a sweetheart, but he doesn’t get much time to shine in this story. The world-building was interesting. I liked the background story about the Everneath and the different trials Nikki needs to survive in order to save Jack. The queen definitely likes her privacy, because those rings around her house (in the centre) are hard! I knew the queen’s identity for a while, but I still like the story Ashton created here. The twist at the ending was awesome. I didn’t see it coming and I was surprised how cunning Cole really is. His way to trap Nikki was crafty and I must say: well played boy! I really liked the somewhat closed ending, but it still makes me very curious and excited for Evertrue! No, I haven't read the novella yet, but I want to! :D Good luck with your exams! The ending, oh my god, that twist still has me reeling. I didn't see that coming at ALL. And I agree, Cole has me so confused! I love the complexity about him though. I might like him a tiny bit more than Jack now. I just want Evertrue NOW. Nice review! Love this book and I totally agree with you about Cole. I love him and I want other people to love him but then he pulls some crap that only reinforces his villain status. Grrr...but I still like him better than jack...sorry not sorry haha. After hearing how awesome Everneath is, I think it may be the next book I'll read (I have it, anyway). And since the second book isn't a disastrous disappointment (because most sequels usually are), I don't think I'll be scared to read it. But I totally get you on that - you're so excited about a book, because you loved the first one, and then you read it and want to weep (at least I want to, most of the time). Now I'm curious about Cole because he seems evil and cunning. And, obviously, lovable, too :D But I'm more interested in Nikki. I like a brave, smart heroine and she seems to be just that. I hate it when that happens. It definitely makes me want to cry. MEL. So glad you enjoyed this! Honestly, I'm so excited for Everbound I don't know why I haven't gotten it yet. I'm a little anxious about the beginning, but I don't think that will be a problem much. Glad Nikki gets some sense knocked into her, though! And that little slip about the ending and Cole and his cunningness makes me die a little. Something bad happened, didn't it? *sobs* I need more Jack and Nikki, now! Haha Oh I remember the mood swings that Cole gave me in book 1 I did NOT like that guy!! I'm glad that Nikki doesn't stay whiny too bc that would have been a big turn of for me I can't stand those types of characters. I did enjoy book 1 and I heard this one was a great sequel I really HAVE to get to it soon before I forget the whole story lol. I love hearing that Nikki is an independent action-taker! So many YA heroine's these days sit back and let things happen to them, so Nikki sounds so refreshing :) Here's hoping I can get over her initial whininess as quickly as you did! And a sneaky Cole tricks Nikki in the end?! Can't wait to find out what he did! It was very exciting ;) I think you're going to be surprised! I know I was. Mood swings... hehe. That's one way to put the fustration Cole put me in. But I don't recall the MC to be whiny for me, oh well. It was some time ago anyway, can't remember now. Awesome review, Mel! <33 Glad you enjoyed this one. I started to read Everneath a long time ago but really didn't care for it. I've seen so many great reviews I really want to try reading it again. Especially when you liked the sequel :) I really want to find out more about Cole, because I found his character fascinating in the first book-what I read of it. Great review! Yeah, I am always nervous going into the second book in a series for that reason, because I am usually disappointed with it. So that's why it is sooo nice to hear from you that that was not the case with this sequel! I am really curious of that ending twist that you mention now... but I still need to read the first book! I'm much more encouraged to read it now that I know you liked this one, Mel! Haha, that is a shame, but you never know where the story is going to! I so need to read this one! 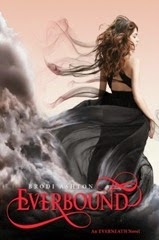 I liked Everneath, but I have a feeling Everbound is just so much better. And yay for endings with twists :D Great review! In a certain way, it was! Everbound sounds great! I have to admit that I have been procrastinating for awhile to start reading this one, but your review makes me want to start reading it now! I do like Cole more because, like you said, he is unpredictable. I may just give this one a chance, since I enjoyed the first one as well. I really loved this sequel!